1. Who is / who owns Northern Images (NI)? 2. How do the artists get paid? 3. Does my purchase “make a difference”? 4. How do I know my artwork is authentic? 5. Can you appraise my sculpture/collection? 6. What should I look for when purchasing a sculpture? 7. What factors affect the price of a sculpture? 8. Will my sculpture increase in value? 9. What types of stone are used in sculptures? 10. What other materials are used in artwork? 11. Why are sculptures different colours? 12. Where does the stone come from? 13. Do styles of art vary between regions of the Arctic? 14. Do you share mailing list information? 16. Will I be charged sales taxes on my purchase? 17. Will I be charged duty on my purchase? 18. Do you ship worldwide? 19. How will my item(s) be shipped? 20. Will my shipment be insured for its full value? 21. What happens if my sculpture arrives damaged? 22. What is your return or exchange policy? 23. What are the regulations re: shipping whalebone and ivory? 24. Why is the item I viewed on your website not available? 25. Do you have a program for Corporate clientele? 26. How do I care for my artwork? 27. Can’t find a specific item you’re looking for? Northern Images is the retail art marketing arm of Arctic Co-operatives Limited, a co-operative service organization owned and controlled by the 32 community-based, multi-purpose Co-operatives in Nunavut, the Northwest Territories and Yukon. Arctic Co-operatives Limited is dedicated to providing services and business development opportunities to communities throughout Canada’s north. 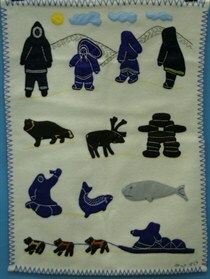 Northern Images supports and promotes northern artists and their products by marketing Inuit and Dene art and crafts in our gallery located in Yellowknife, Northwest Territories. A cornerstone of the Northern Images operation is our commitment to fair and timely compensation for Co-op member-artists. The artists bring their original works of art to their local community Co-operatives where it is professionally valued and purchased before it even leaves the community. The Co-ops forward the artwork to our Mississauga show room for distribution to various galleries, including Northern Images, where it is displayed and marketed to the public. Absolutely! Through the promotion and sale of authentic Inuit art, we perpetuate this market for future generations and assist in ensuring the sustainability of the northern heritage, while providing an essential cash flow to the participating Co-op member-artists and their communities. Sorry, we do not offer an appraisal service at this time. Although some of the criteria in FAQ #6 may affect the price of a sculpture, perhaps the most important factor is the artist’s reputation. A beautiful carving done by an unknown Emerging Artist will not command the higher price point that a similar sculpture carved by a world-renowned Master Carver would. Many factors are responsible for the value of Inuit sculptures, making this art form an excellent investment. a) International interest in Inuit art continues to grow substantially. demanding than hand-mining carving stone, which is dangerous and gruelling work. indoor government jobs (with benefits) much more appealing to the younger generation. days of travel that make holding a non-traditional job difficult. c) The best carvers of animals seem to be hunters who have a first-hand familiarity with the animals they carve. are missing out on this traditional resource to add quality to their carvings. Over time, as fewer quality pieces become available, the value may increase. The colour of stone varies between regions as a result of the varying mineral content of the land from where it is quarried. Artists get their own stone from mines in their region, usually located a significant distance from their home community. After several days of travelling to the desired location, artists mine the stone by hand using picks, axes, grinders and crowbars. Dynamite cannot be used because it damages the stone. After manually removing the stone from the mine piece by piece, it is loaded and hauled back to the community. As there is only a small window of time to retrieve an adequate supply of stone for 8 - 10 months of work over the winter months, the artist may have to make several return trips to the mine for additional supplies. Just as the type of stone or other medium used to create beautiful works of art varies between regions, so do artistic styles. As a result of the type of stone that is available for artists to work with, each art-producing community has developed its favourite themes and styles. (e.g. destination, weight, dimensions, etc.) Click here for our complete Shipping Policy. Your shipment is insured for loss or damage by the carrier. We take great care to pack your shipment to ensure damages do not occur. In the unlikely event an item is damaged during shipping, please contact us immediately for instructions. The item may have been purchased by another customer. the mythology of Canada’s Arctic. Handle your carving with care to avoid scratches (e.g. from jewellery) and/or breakage. Carefully support your carving with non-slippery, latex gloves when moving it. To clean, dust it with a soft cloth, or use a watercolour paint brush to dust away dirt embedded in crevices. Bone, antler and ivory pieces should be kept away from doorways, air vents and direct sunlight. Ivory, in particular, reacts to changing humidity levels by swelling and shrinking, which can cause the piece to crack and warp. Ivory also yellows naturally. This is its natural patina; do not attempt to bleach it out. Prints should be displayed in darker areas, as they can fade if exposed to too much light (sunlight or artificial). Simply give us a call or send us an e-mail with the particulars, such as the desired subject matter (e.g. polar bear, owl sculpture, print, etc.) and the approximate dimensions. We would be pleased to help you select the perfect piece to compliment your décor.